Google TV hasn't enjoyed a smooth ride since its debut in the United States in early 2011. The service has not been widely adopted through Logitech set-top boxes or via the Sony Internet TVs or Google TV-equipped Blu-ray players currently on the market. CES 2012 brings the first 3D TV equipped with the Google TV software thanks to a new partnership with LG. The G6 series comes loaded with Google TV 2.0, LG's super-fast L9 chipset (which LG says is faster than Sony's Internet TV) and is the first Google TV to benefit from 3D thanks to LG's 3D Cinema passive platform. The G6 series is currently a US only released but when Google TV comes to the UK in "early 2012" we can expect LG to roll-out the set (or one similar) across the pond. Although it's officially an LG Smart TV, the G6 Series TV doesn't feature the interface and app selection we've become accustomed to. 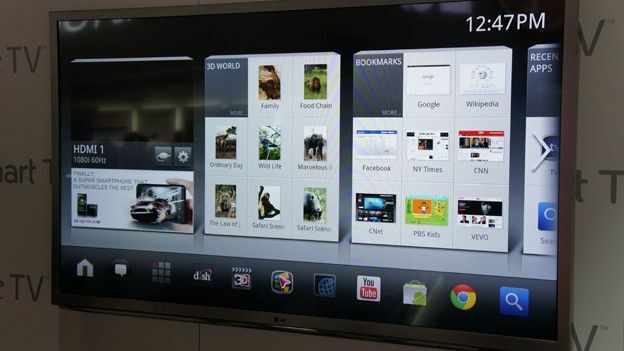 LG has simply placed a Smart TV-like skin over the general Google TV user interface, which definitely gives the platform a little more polish and provides faster access to the key Google TV functionality through the homescreen. However, that's where the similarities to LG's own connected TV platform ends. There's no access to the LG Smart TV app store, so any apps you download to the platform need to be from the built-in Android Market. LG says its chosen this route to appeal to those already familiar with the Android ecosystem and those who prefer to use Google's software. From that point, it's easy to access your favourite apps, the Android Market as well as the Google Chrome web-browser. It's the latest version of Google TV so there's also the latest version of the YouTube app and a burgeoning selection of content from third-party developers. Of course, the idea behind Google TV is that it also links up to the TV packages you have at home, so searching for a TV show will bring-up listings from live TV as well as the on-demand platforms featured on Google TV or downloaded from the Android Market. Google says it takes around ten minutes to configure the channels you actually have so Google TV won't make suggestions for channels you have no access to. With the bulk of the Smart TV platform largely absent from the G6 set, which will arrive in 47 and 55-inch iteractions, LG is hoping the presence of 3D for the first time on Google TV will twist viewers' arms into opting for this platform. Naturally the Logitech Revue box didn't offer 3D and neither did Sony's Google TV-equipped TV and Blu-ray player. The G6 set comes packed with LG's 3D Cinema standard, which is passive 3D to you and I. From an interface level, 3D feels at home on the Google TV platform and will, of course, be complemented by the 3D video you can access either from the homescreen 3D video app or through the TV packages you subscribe to. Picture quality is as we've come to expect from LG's 3D Cinema standard on the L-Series TVs. In fact there's nothing new here. 3D images were blur-free and extremely clear. LG has chosen to debut a new motion-sensing remote control with this G6. It breaks from the elongated slim Magic Remote the company is still pushing and offers a palm-sized form factor and offers a full qwerty keyboard on the rear, which serves Google TV well due to the built in Chrome web-browser. The Wi-Fi enabled Magic Remote Qwerty still boasts the same Wiimote-esque precision when navigating around the OS, although the unit we tested appeared to be a little more sluggish than the streamlined iteration. That may be down to software or the Wi-Fi connection in the convention centre, however. The nicely-curved remote also boasts a 3D button which enables instant conversion of 2D to 3D pictures, while there's also voice recognition, meaning that you can enter text using your voice rather than typing it into the search box. During the brief preview we had with the LG Google TV, we found it to be the most impressive iteration of the service yet. The Smart TV skin is certainly easier to use and more convenient than the Google-built software, allowing for easy content discovery. We felt instantly comfortable with how the interface was laid out. Adding 3D to the mix helps matters and gives LG's effort a unique selling point over rival tech from Sony and Logitech, as will the Magic Remote Qwerty with its voice regognition tech which makes the often-arduous experience of typing into connected TV plaftorms that little bit easier. If Google TV is really going to take off, a larger range of apps from top content providers is hugely important, but innovations like LG's will also make it more appealing to those currently giving the service a wide-bearth in favour of existing and well-functioning connected TV plaftorms. Google made no mention of when the G6 or other LG TVs boasting the Google TV software will become available in the US, let alone us in the UK. Pricing was not announced either, but it's not likely to be cheap.